Located on beautiful Kinko Bay is the city of Kagoshima, the southernmost major city in Kyushu. With its warm tropical climate, abundant palm trees, and bustling bay some even refer to it as the ‘Naples of the East’. The most notable feature in Kagoshima that sits 3,665 ft. above sea level is an active volcano, Sakurajima, which translates to ‘Cherry Blossom Island’. 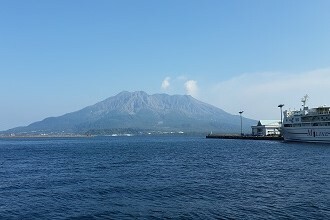 Sakurajima is also the most active volcano in all of Japan! It’s not uncommon to occasionally see ash falling lightly throughout the city. It wouldn’t be a visit to Kagoshima without trying its rich regional specialty, kurobuta, or black pork which is known for its tenderness and high quality. This delicious favorite can be found in many restaurants and shops throughout the area and served as tonkatsu which is breaded and deep fried or shabu shabu which is thinly sliced and boiled in water. When you’re not visiting your favorite food spots, you can take a stroll through the coastal Senganen Garden which is widely attractive in any season. Another popular activity in Kagoshima is visiting one of its 270 onsens, or hot springs. Those looking for a unique onsen experience should visit Ibusuki’s sand baths. This hot spring allows visitors to be buried in sand which has been heated by hot spring water! From its convenient city life to its extensive nature, Kagoshima truly has something for everyone.